"There is so much to appreciate in a good piece of pottery. 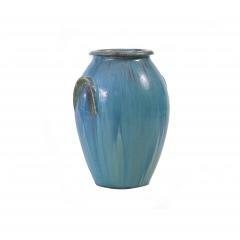 The fine patterns of delft and the exciting glazes of an art nouveau urn all complement a collection so significantly. 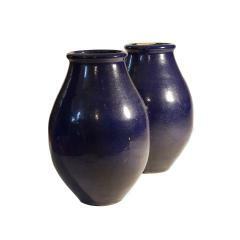 If there is a piece of pottery you are looking for and do not see, please call or email, we may not have cataloged it yet." 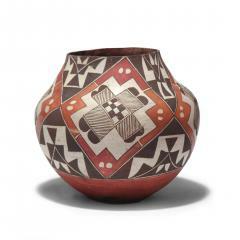 A nicely bulbous formed olla with bold geometric patterns in dark brown, orange and white colors. 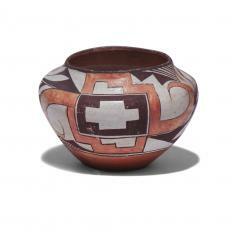 A finely done brown and white and orange geometric decorated olla with center crosses and a red clay base. 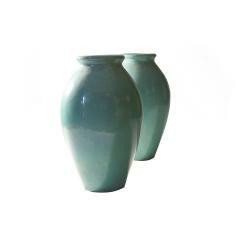 A pair of medium sized urns with wonderful blue-green glaze and matching ribbed molding around the circumference of the urns. 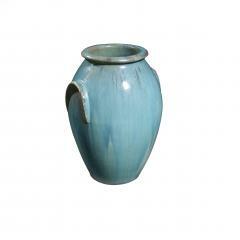 Large urn with wonderful blue-green glaze and molded handles. This is one of three urns of matching color and proportions. 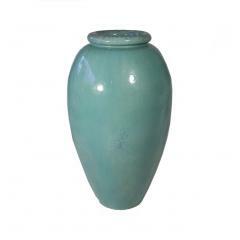 A nice verdigris glaze on exceptionally large urn made by the Galloway Terra-Cotta Company. 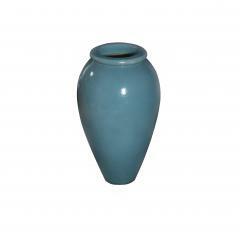 A striking urn with an excellent glaze and a bulbous form and molded lip. Made by the Galloway Terra-Cotta Company. 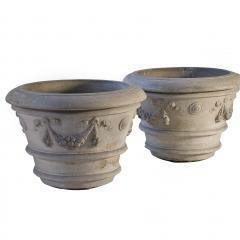 These attractive urns in a rare glaze have a bulbous center tapering towards a molded top with a pronounced lip. Most striking of these urns are the bright and nicely textured glaze on each. They are an elegant example of the later art nouveau period. 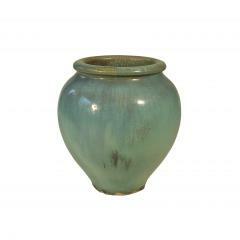 Excellent worn verdigris glaze on exceptionally large urn made by the Galloway Terra-Cotta Company. 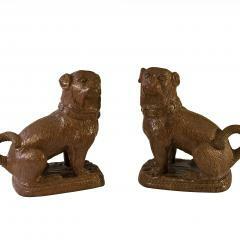 A life size pair of beautifully rendered ceramic recumbent French bull dogs. Their casts were finely carved and show considerable detail on the hair, face, collar and pedestal. 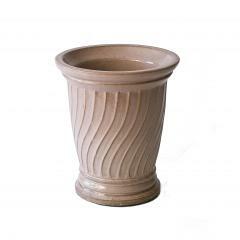 An unusual turned pot with molded rim and swirled sides. The buff color is rare. A Galloway mark and style number are underneath the base. 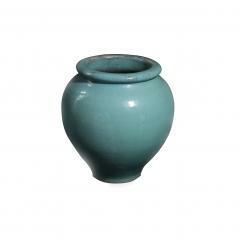 Large urn with wonderful blue-green glaze and molded handles. 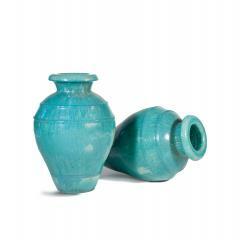 This urn is one of three of matching color and proportion.